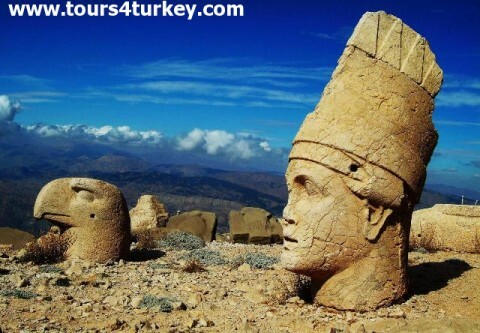 Tours4Turkey Travel provides an opportunity to visit Nemrut mountain from Cappadocia. Nemrut Dağ (mountain) is the Hierotheseion (temple-tomb and house of the gods) built by the late Hellenistic King Antiochos I of Commagene (69-34 B.C.) as a monument to himself and is among the World Heritage sites listed by UNESCO. Two separate antique processional routes radiate from the east and west terraces. Five giant seated limestone statues, identified by their inscriptions as deities, face outwards from the tumulus on the upper level of the east and west terraces. These are flanked by a pair of guardian animal statues – a lion and eagle – at each end. The heads of the statues have fallen off to the lower level, which accommodates two rows of sandstone stelae, mounted on pedestals with an altar in front of each stele. One row carries relief sculptures of Antiochos’ paternal Persian ancestors, the other of his maternal Macedonian ancestors. 08:00 We will pick you up from your hotel and depart from Goreme for Nemrut Tour from Cappadocia. 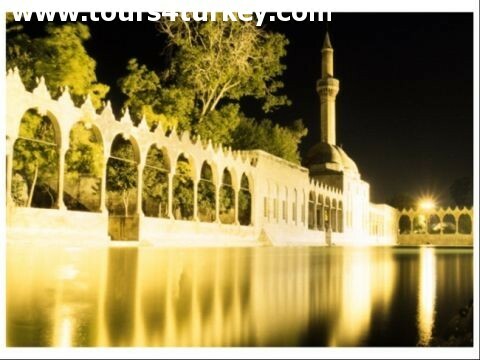 After passing Kayseri city, we will visit the 13th century Seljuk Caravansary "Karatayhan". Our next stop will be in Pinarbasi for a short tea break. Then we will keep driving to Tekir for Lunch. After taking pictures of the gorgeous scenery of the Tekir Valley, we will drive to Kahta and check-in to our hotel. Our Mt Nemrut tours are fully guided and covers all needed services during 3 days. The tour guide will be with you from the beginning of the tour. The bus to Nemrut from Cappadocia will have enough stops. We will depart from the hotel very early in the morning and head up to the ruins on Mt. Nemrut. At the end of the journey, we will walk about twenty five minutes to the summit of the Mt. Nemrut. Here we will watch the beautiful sunrise between the colossal size statues and heads of the kings and Gods. After sunrise on top of Mt. Nemrut , your guide will give you information about the Commagene Kingdom and the statues, whilst showing you around, giving you opportunities to take pictures. Then we will drive back to the hotel for breakfast. On the way back to the hotel we will visit the ruins of the Arsemia Roman bridge of Cendereand Tumulus Tomb of Karakus. After breakfast we will begin driving to Sanliurfa and Harran and visit the Ataturk Dam, which is the biggest dam in Middle east. We will check-in to our hotel in Sanliurfa and have our lunch here. After lunch we will visit Abraham's Cave and the Pools of Holy Carp surrounding the cave. We will then walk around the oriental covered bazaar and drive to ’Harran’ a village of Spellbinding Mud-Brick "beehive" houses, as mentioned in the book of genesis, where Abraham spent the last years of his life. After visiting the ruins of Harran including the city walls, the oldest Islamic university and the castle dated back to 18th century, we will drive back to the hotel. After breakfast we will depart from Sanliurfa to Birecik, which is known for its bald-ibis (Kelaynak) birds. This is the only place in the world where these birds can be found and there is currently a very limited population remaining. We will also visit a breeding farm for the Bald Ibis birds. After our lunch, we will drive up to the Taurus Mountains, where we will have a short tea break, before driving back to Goreme. 18:00: Tour ends in Cappadocia. Thank you very much for booking your Mt Nemrut Tour from Cappadocia with tours4turkey. We hope you enjoyed your Nemrut Tour from Cappadocia with us and we are looking forward to seeing you again.